This is a page devoted to the slides supplied with a Cary Transitional Achromatic Microscope. Although the cases and slides are similar to those supplied by Andrew Pritchard, there is good reason to think they were also supplied by Cary. 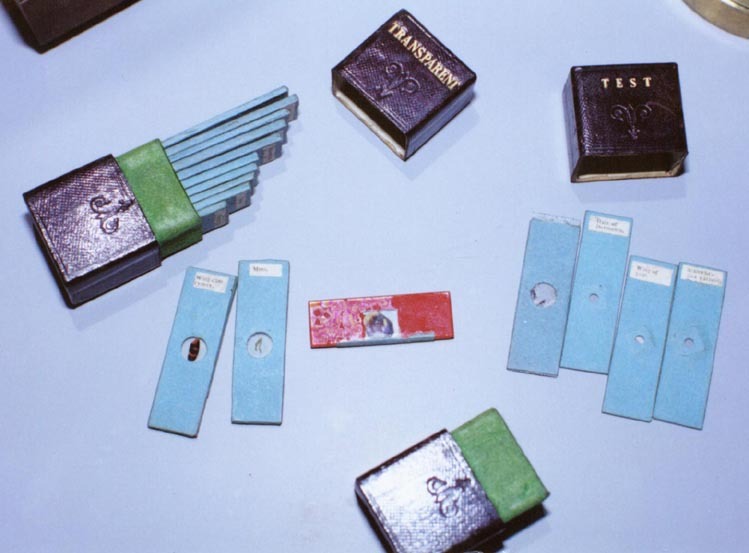 There are seven slides that were contained in the box labelled 'Test' but since only four are thin and with thin glass coverslips, the other slides may have simply been stored in the 'Test' box as there was no more room in the other box for them. 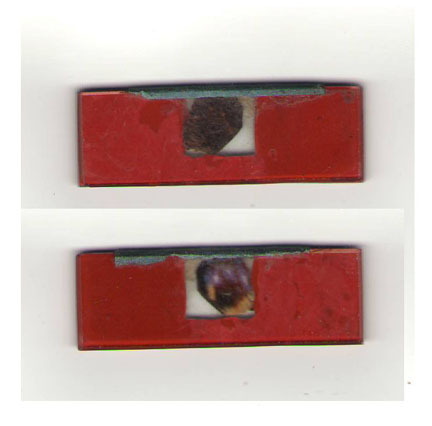 A single slide in the 'Test' box is different than the others, being two glass slides with the subject between but the slides are sealed together with red wax. This wax-sealed slide contains a large piece of a wing of a butterfly. The slides are contained in two dark-maroon colored tooled leather cases, typical of those also sold by, and signed by Pritchard, though these two cases are unsigned. 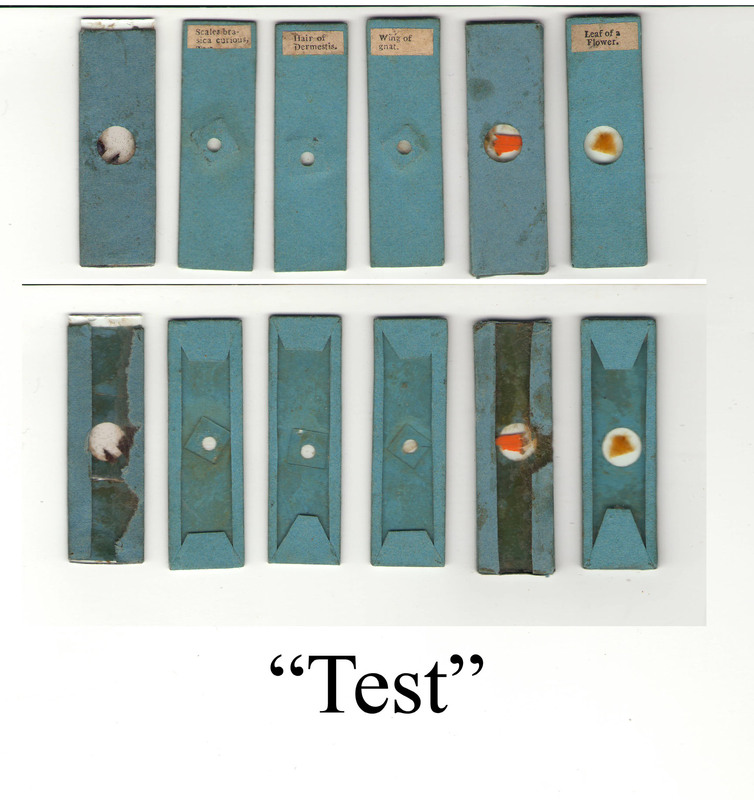 One of these slides is different than the others in that it consists of two slides cemented together by red wax, but it has lost almost all of its blue paper cover. The test objects have small square cover slips which can be seen as raised diamond-shapes under the blue papers. These slides, specifically under the categories of 'Transparent' and 'Test' slides are mentioned in the books of Charles Gould, the inventor of the Cary-Gould microscope and the man who supervised much of the microscope production for the Cary company. 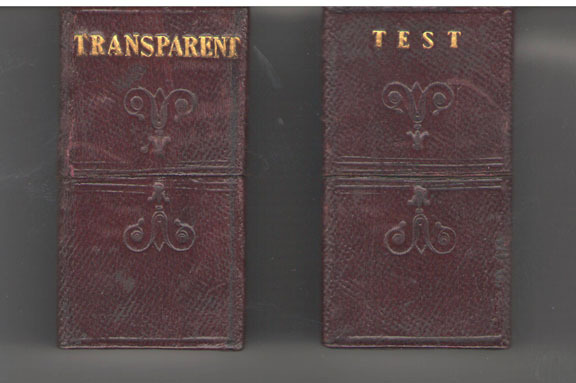 Although the case labelled 'Transparent' does indeed contain nine specimens suitable for viewing with transmitted light, only two or three of those contained in the 'Test' case appear to be slides intended for testing. 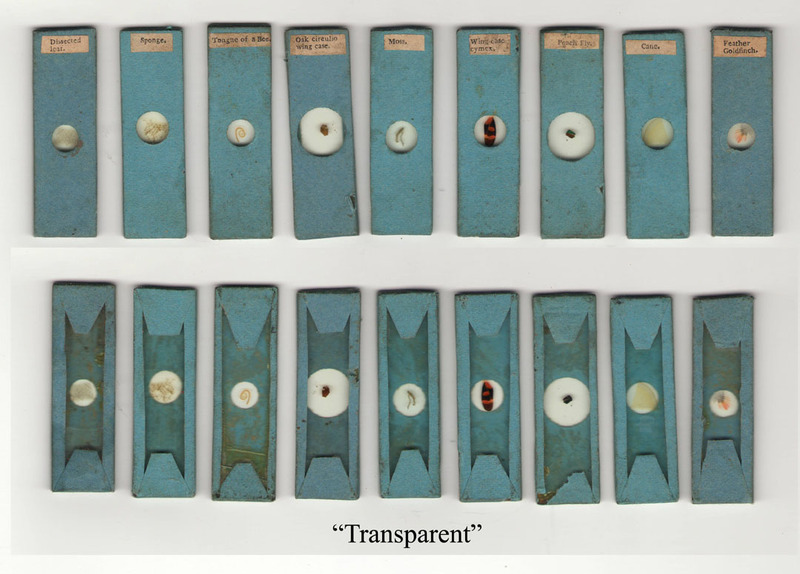 It is interesting to note that although both types of slides are covered with blue wrapers, and both are labelled with printed labels that were likely cut from a list, the 'transparent objects are mounted between two thick slides, whereas the 'test objects are mounted on thinner slides with a glass cover slip over them and the paper over all. As noted in Gould's book, only the two slides labeled 'Scales of Brassica, curious' and 'Hairs of Dermestes' are among those mentioned as test objects in his books.